New brain-computer interface restores the sense of touch in the hand of a paralyzed man. Touch is essential for hand use, however, brain-controlled prosthetic limbs have not been endowed with this critical sense. 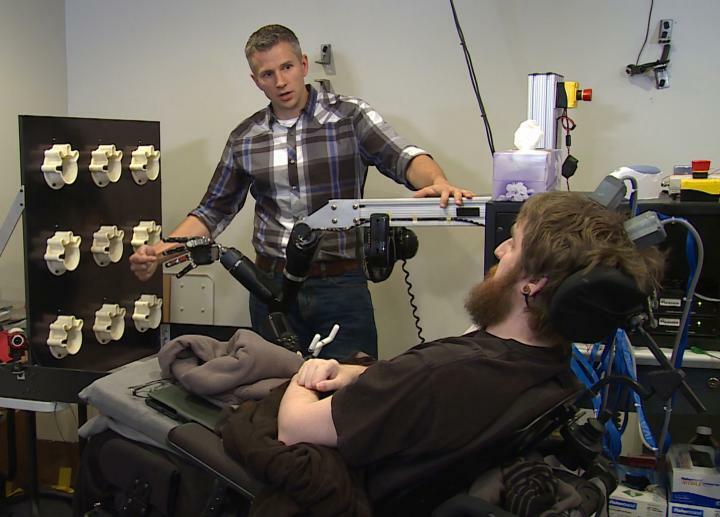 Now, a study from researchers at the University of Pittsburgh develops a brain implant which restores the sense of touch in the hand of a paralyzed man, who described the sensations as mimicking natural touch. The team state that their device also helped the patient sense touch using a robotic hand, paving the way to improving artificial touch in neuroprosthetic limbs. The study is published in the journal Science Translational Medicine. Previous studies show that brain chips can electrically stimulate neurons to recreate the perception of touch, a technique known as intracortical microstimulation. And while the tool has proven promising in animal studies, how life-like the artificial sensations actually feel in humans remains an open question. The current study implants microelectrode arrays into the primary somatosensory cortex of a person with spinal cord injury and, by delivering current through the electrodes, generate sensations of touch perceived as coming from the patient’s own paralyzed hand. The current study recorded the sensations felt by a 28-year-old man with tetraplegia from a spinal cord injury, who had electrodes implanted into the somatosensory cortex, the part of the brain that controls touch. Results show that electrically stimulating this region bypassed the patient’s spinal cord injury, evoking sensations like warmth and pressure originating from the upper palm and base of the four fingers on his right hand. The patient described 93% of the stimuli, such as pressing a cotton swab on the surface of the skin, as feeling “possibly natural”. Data findings show that the patient was also able to sense touch when connected to a prosthetic limb, correctly identifying 84% of the time which individual prosthetic finger was being touched while blindfolded. Results show that the subject’s sensations remained stable over the course of the six-month study. The lab state that their findings suggest electrical brain stimulation can help reestablish realistic touch in paralyzed, and potentially amputee, patients, which may guide the design of better neuroprosthetic limbs. The team surmise their findings suggest that microstimulation within the hand area of the somatosensory cortex of a person with long-term spinal cord injury evokes tactile sensations perceived as originating from locations on the hand. They go on to add that their work makes use of the brain’s natural, existing abilities to give people back what was lost and not forgotten. For the future, the researchers state that the ultimate goal is to create a system which moves and feels just like a natural arm would. Researcher Rob Gaunt prepares Nathan Copeland for brain computer interface sensory test. This material relates to a paper that appeared in the 12 October 2016, issue of Science Translational Medicine, published by AAAS. The paper, by S.N. Flesher at University of Pittsburgh in Pittsburgh, PA, and colleagues was titled, “Intracortical microstimulation of human somatosensory cortex.” Credit: UPMC/Pitt Health Sciences Media Relations OR UPMC/Pitt Health Sciences.